Welcome back and this is my day to share my card with you. This very cute ribbon on my card is in the the Really Reasonable Ribbon March Ribbon Club. Springtime is in the air and Really Reasonable Ribbon has the variety of gorgeous ribbon and supplies for those holiday and birthday cards or projects for this time of year. Isn't this ladybug ribbon just adorable? 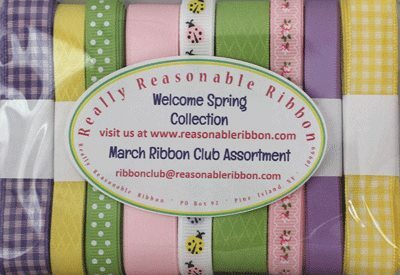 This is the 3/8" Multi Pastel Ladybug Grosgrain ribbon and you can buy this separately but it also comes in the March Ribbon Club Assortment called "Welcome Spring Collection". What a very nice assortment of ribbon this month to go with those springtime projects or cards. I used 1/4" Scor-Tape to attach the ribbon and bow on the card which is also available at Really Reasonable Ribbon. The gorgeous Wild Orchid Craft flowers also came from Really Reasonable Ribbon. There is a wide variety of these flowers at reasonable prices. These flowers are gorgeous on any project or card. Check out my Ladybugs Tutorial on how to make these ladybugs. I made several at a time and store them for future use. The design team always have gorgeous projects or cards to share with you on the Really Reasonable Ribbon blog and we would love to see what you created on the Really Reasonable challenges.